Mail a card or letter. Yes, “snail mail.” Sending cards for major holidays – Christmas, Thanksgiving, birthdays – may be obvious choices, but are always welcome. Receiving cards for lesser holidays – think Valentine’s Day, Halloween, or an obscure National Donut Day – will be a pleasant surprise. Even more unexpected, a card or hand-written note just to say: Hi! I’m thinking of you! Who doesn’t like to receive mail with their name on it? If it comes in a bright envelope, or contains stickers, even better! Gift a magazine subscription. There are magazines for just about any hobby or interest one can come up with. Find one that corresponds with your child’s interests, and send him a subscription. Every month when he receives the latest issue, he’ll be reminded that you love him and care about what interests him. Talk to teachers. It’s easy to get out-of-the-loop when you’re not local – especially if your ex was the parent who dealt more with school relations prior to divorce. Make an effort to have first-hand information about how your child is doing in school and any academic or social problems she may be having. While it’s not fair to ask teachers to do everything twice, make sure the teacher has your email address and request that you be included on emails that are sent out. You can also ask if it is possible to schedule a parent/teacher meeting via phone or digital means. Check the school’s website on a regular basis to stay in-the-know about policies, upcoming events, and other helpful information. Subscribe to the hometown newspaper. This will keep you informed about the local sports, give you a heads-up about upcoming events that might be relevant for your child’s visitation or give you gift ideas, and can give you topics of mutual interest to chat with your child about. Record yourself reading. While it’s enjoyable to read a story to a child during a virtual visit when you can see each other’s face, it ends with the call. Sending your child an audio or video of you reading a favorite story allows her to experience a missing-parent-fix even when you’re not available. Have fun with it – maybe a story of the month? Or an ongoing story that has weekly installments? Clip pictures, cartoons, articles to share. Pop them in the mail with a post-it note that says “this made me think of you,” take a picture and text it with a “thought this would crack you up,” or attach it in an email with “this reminded me of when we . . . ” I still have a couple of comics my mother snipped out of a Sunday paper decades ago and gave me because they reminded her of amusing exchanges we’d had. Those (now yellowed) comics still have the power to put a smile on my face and make me feel special! Watch a TV show together. This can be done in real-time, with phone calls during commercials to compare notes on the show’s progress. Or record it, watch at the designated time, texting comments during the show with a phone call to trade reactions to the ending. If a weekly series doesn’t work in the schedule, maybe a virtual movie date fits the bill – complete with bowls of microwaved popcorn at each home prepared directly prior to the coordinated screening! Start a book club. Take turns picking out the book-of-the-month, then coordinate how many pages will be read during a specific time frame. Keep a joint online book log of the books you read, how you both rated them, and any comments each had to make about the read. It will be fun to watch the list grow! The personal book club also works well with multiple children if the children are close enough in age and/or reading ability. Collaborate on a volunteer project. Working with your child, in spite of the miles between you, to accomplish the common goal of doing something kind for somebody else is a precious bonding experience. There are many charities that appreciate hand-crafted donated items that bring comfort. Here’s some examples: For sewers: each of you could make cloth doll or teddy bear parts, then assemble and stuff when together and donate to shelters or child foster care programs. For knitters: each knit or crochet individual squares that can be pieced together during physical visits and donated to homeless shelters or for prizes for fund-raising charity events. For the young artists: You provide cardstock or construction paper, your child makes greeting cards with hand-drawn pictures and well wishes (he can show you his growing collection during virtual visits! ), and when you’re together you deliver them to a children’s hospital or mail them to service members. Click HERE for more kid-friendly volunteer projects from Parenting. 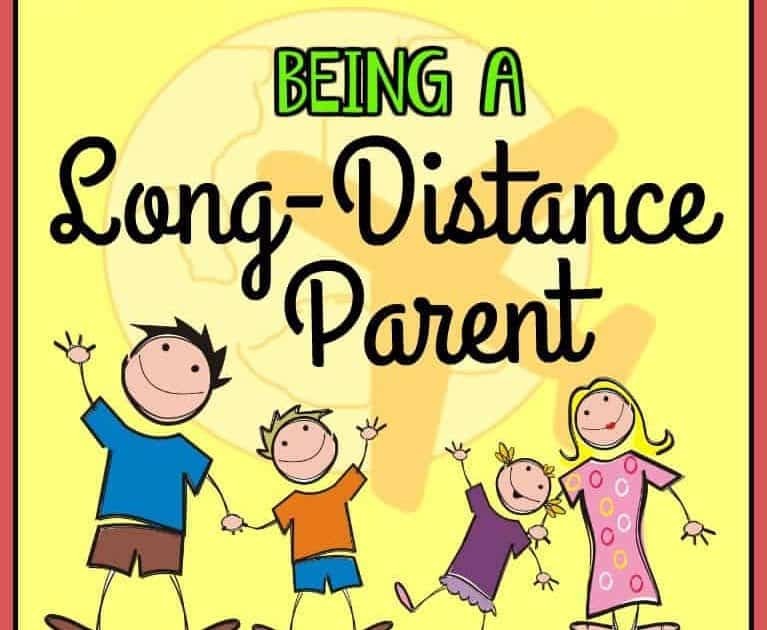 Even though it is tough for you and your child to be so far away from each other for much of the year, the “distance” doesn’t have to mean “disconnect.” With a little creativity you can close up those miles, enjoy quality time with your child even when you can’t be in the same place, and rock being a long-distance parent! I think this whole thing is kind of sad. When my little girls were first put in the situation of a split home, I called them and sang them bedtime songs on the phone since I couldn’t do it in person anymore. They laughed seeing the comical side of it, so it didn’t last long. Kids are resilient. Adults, not as much. Even now that they are at college, I need to creatively find ways to connect. It can be sad, Janice. One of the very few upsides is that at least with today’s technology, children can at least see their away parent in real time – probably not a common option when your girls were young. Having seen first-hand your creative ability, I have no doubt that you are rocking the college connection!! Great ideas and also I play Words With Friends and leave comments praising their words that they respond to daily! Having continuing online or phone games is another great idea – thanks, Stephanie. And thanks for visiting!